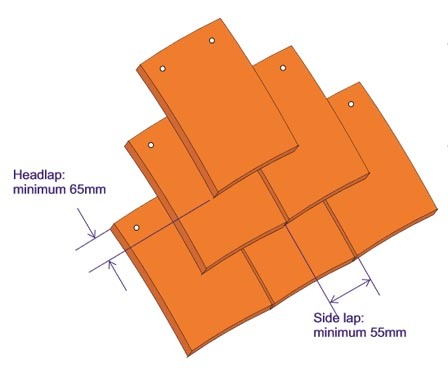 The side lap between tiles in subsequent courses must not be less than one third of the width of a standard tile; ie for 265 x 165mm tiles the side lap must not be less than 55mm. The headlap between tiles in the course below but one must be not less than 65mm. 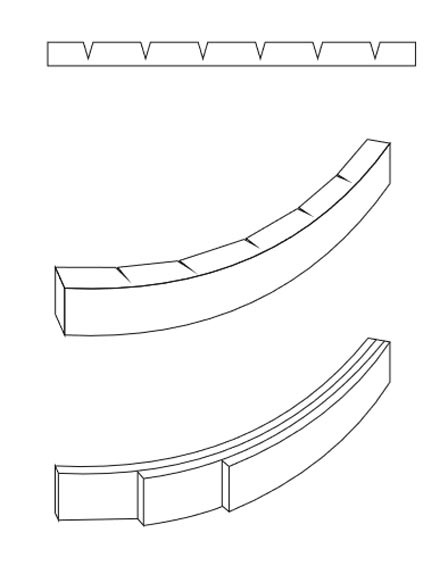 The battens are ‘scarfed’ by sawing a series of short cuts into one face of the batten and this allows the batten to bend in the scarfed direction. An alternative method is to use layers of thin battens, built up to the required thickness. 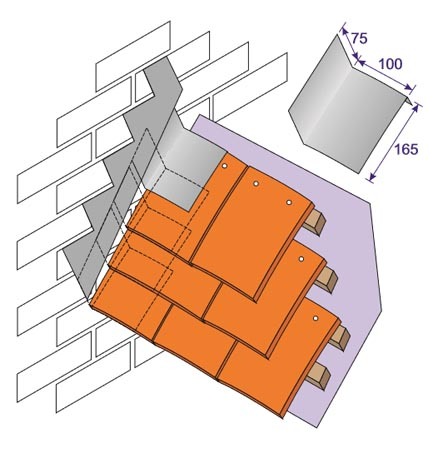 For example, 4 layers of 6mm battens could be used. If practical and there are facilities on site, soaking and/or steaming the battens will greatly aid their ability to bend and conform to the curved roof surface. Soakers can be cut from code 3 lead. 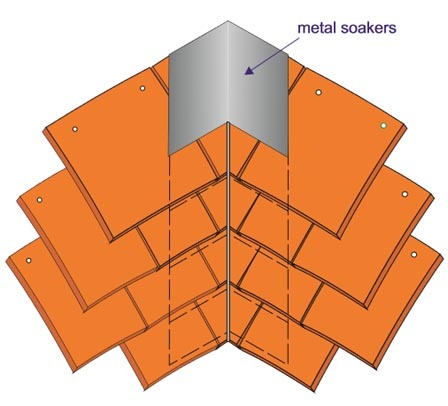 The length of each soaker should equal the tile gauge + the headlap; ie 100 + 65mm = 165mm. When cutting the soakers, allow an extra 25mm length for turning over the top of the tile. The step cover flashing must cover the soakers by at least 65mm. The lead saddle at an abutment should extend 150mm along the ridge and 150mm down each roof slope. 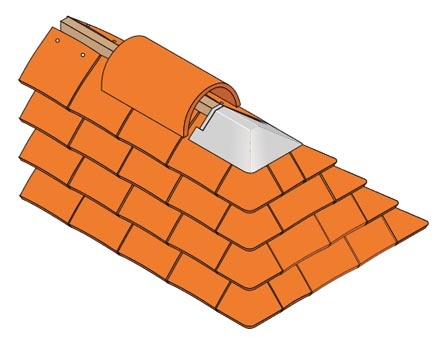 The edge of the saddle under the ridge tile should terminate in a welt. For steeper roof pitches it may be necessary to form the saddle using lead welding. At a junction of a ridge with a hip a lead saddle should be fitted. This should extend at least 100mm down each roof slope. A lead saddle should be fitted where two tiled valleys meet. This should extend at least 100mm down each roof slope. 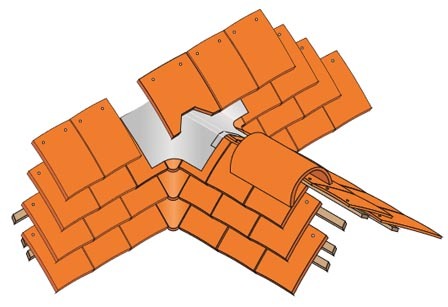 The top edge of the saddle should extend at least one tile head lap and terminate by turning over the head of the tile. 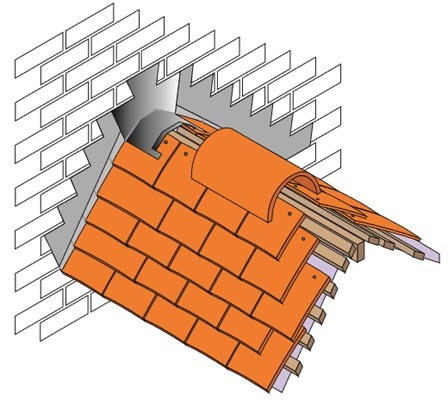 The edge of the saddle under the ridge tiles hould terminate in a welt. Valley soakers should be used on every tile course in a mitred valley detail. 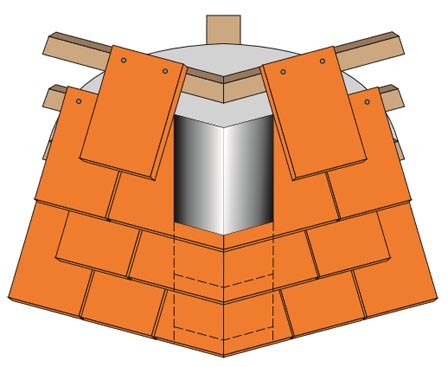 Each soaker should extend at least 150mm to either side of the valley and is held in position by turning over the heads of the tiles below. Valley soakers are not recommended for use on roof pitches below 50 degrees, on valleys longer than 6 metres or where water is discharged into the valley from other roof slopes. Hip soakers should be used on every tile course in a mitred hip detail. Each soaker should extend at least 100mm to either side of the hip and is held in position by turning over the heads of the tiles below. Hip soakers are suitable for all plain tile roof pitches.